I managed to carry the momentum I had starting this quilt through to the end and now it's on its way to Lindsay so that she can work her long-arm magic. I used this video tutorial and am pretty happy with the result. Especially since I started this quilt as a way to burn off some stress and avoid writing a paper for a couple more hours. It was fun to just pull some random jelly rolls from the stash and start slicing. I managed to let go of my obsessive tendencies a bit on this one (inspired by Anne's recent post) which means no fussy cutting, zero agonizing about layout and a questionable adherence to the quarter inch seam rule. It felt great! A quick and simple project. Exactly what I needed to get my quilting mojo back again. Aside from the fact that this turned out great, striking colors and design, isn't it fun to just grab fabric and sew? That's what I did with my cabins. Oooh this is gorgeous! 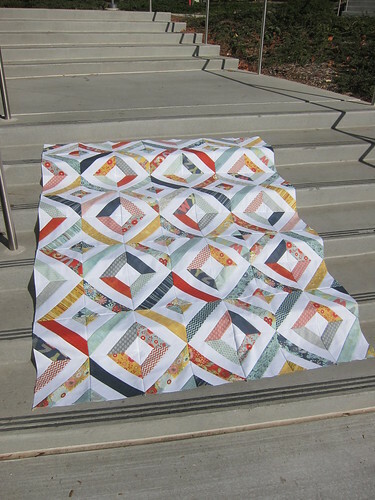 Yes, this sounds like a perfect relaxation quilt, and do you know what? I bet no-one will ever know about your questionable adherence to the 1/4" seam rule either! Pretty! I have been looking for a jelly roll pattern for some Kate Spain Terrain I bought years ago - yours looks lovely. Oh boy, your obsessive ways sound just like me! It is SO hard for me to just do something without thinking and agonizing it to death. 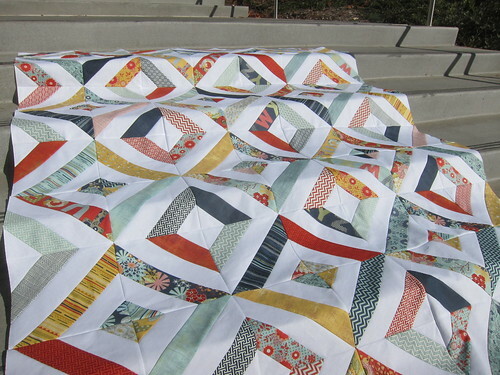 Glad to hear that you got over that a bit, and the quilt top is beautiful! AH! so fun. Very pretty!!! Yay for letting go!! :D (Can you help me do the same?) 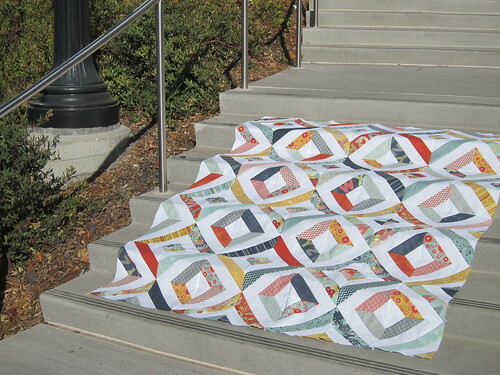 I love finding awesome jelly roll quilt ideas for quick finishes, and this is beautiful!